Training course for youth workers, "Safe and Smart" was held in sighetu Marmatiei of Romania from 24th to 31st of July 2017. 30 participants from Romania, Greece, Span, Lithuania, Hungary and Italy took part in this project. 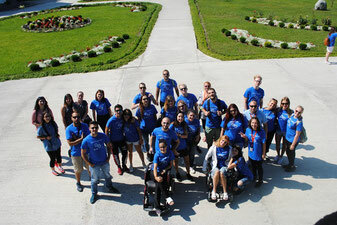 Main aim of the training course was to promote and ensure safe participation of disabled youth in Erasmus+ activities. During the project, youth workers, young people with and without disabilities participated in various activities- discussions, observations, role plays, simulation exercises, evaluations, etc. the general goal of the project was to prepare for development of a guide for youth work for young people with or without disabilities/reduced opportunities in life. Click here to see photos of the project!